Building on earlier work, a team of researchers led by neuroscientist Lauri Nummenmaa of the University of Turku, recruited 1,026 participants to help them map how we perceive 100 common feelings(1). Subjective feelings are a central feature of human life. We defined the organization and determinants of a feeling space involving 100 core feelings that ranged from cognitive and affective processes to somatic sensations and common illnesses. The feeling space was determined by a combination of basic dimension rating, similarity mapping, bodily sensation mapping, and neuroimaging metaanalysis. A total of 1,026 participants took part in online surveys where we assessed (i) for each feeling, the intensity of four hypothesized basic dimensions (mental experience, bodily sensation, emotion, and controllability), (ii) subjectively experienced similarity of the 100 feelings, and (iii) topography of bodily sensations associated with each feeling. Neural similarity between a subset of the feeling states was derived from the NeuroSynth meta-analysis database based on the data from 9,821 brain-imaging studies. All feelings were emotionally valenced and the saliency of bodily sensations correlated with the saliency of mental experiences associated with each feeling. Nonlinear dimensionality reduction revealed five feeling clusters: positive emotions, negative emotions, cognitive processes, somatic states and illnesses, and homeostatic states. Organization of the feeling space was best explained by basic dimensions of emotional valence, mental experiences, and bodily sensations. 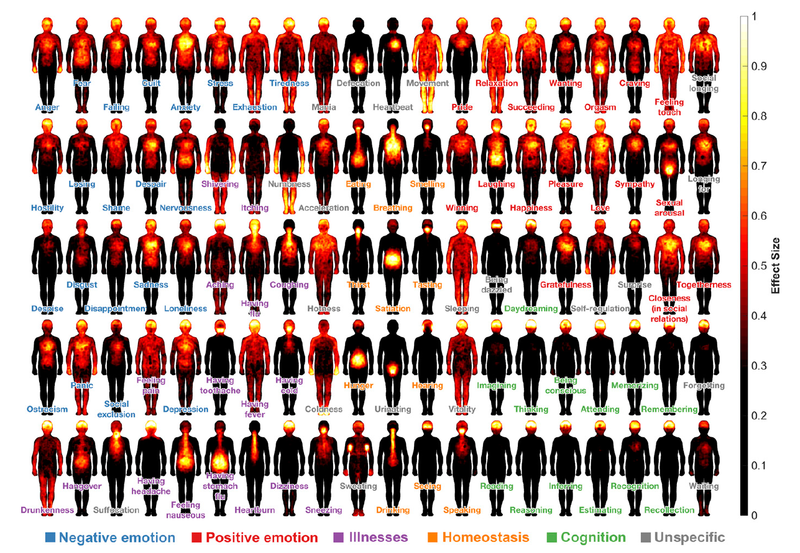 Subjectively felt similarity of feelings was associated with basic feeling dimensions and the topography of the corresponding bodily sensations. 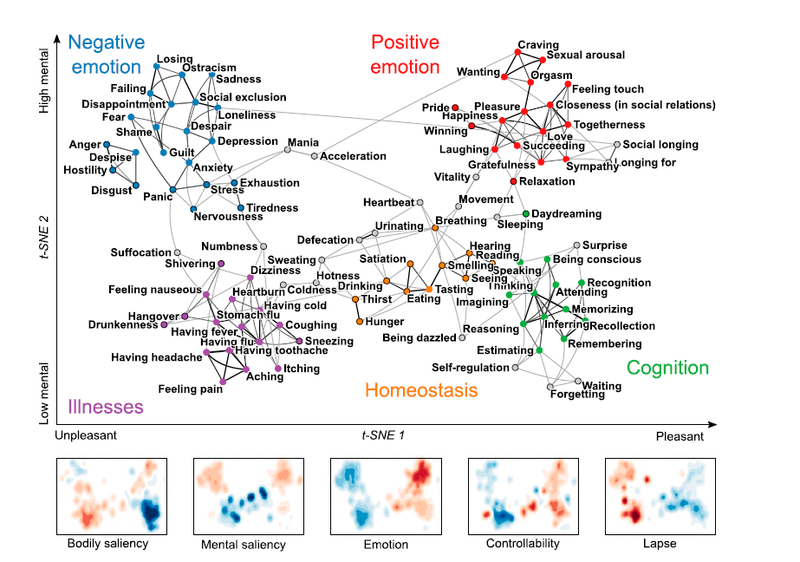 These findings reveal a map of subjective feelings that are categorical, emotional, and embodied. (1) Nummenmaa, Lauri, et al. ‘Maps of Subjective Feelings’. Proceedings of the National Academy of Sciences, vol. 115, no. 37, Sept. 2018, pp. 9198–203. http://www.pnas.org, doi:10.1073/pnas.1807390115. Previous Reinventing liberalism: It’s the people, stupid!